Planning a unique and romantic wedding requires a lot of work – every decision you make, down to the colours of the chair ribbons and the jewellery on the bridesmaids, has to be perfect. You’ll remember this day forever, after all. With so much planning to secure great memories for you and your loved ones, an ice sculpture wedding decoration could be the perfect hassle-free focal point that adds the finishing touch to your special day. 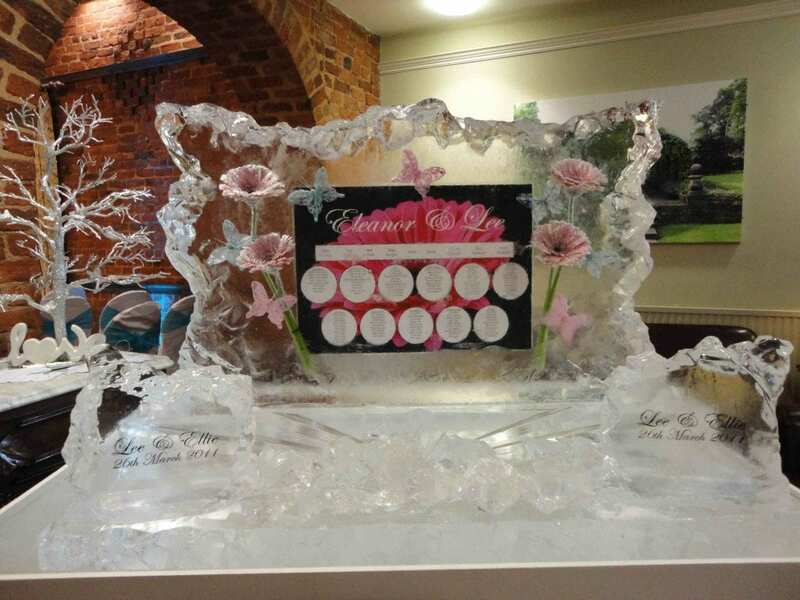 We have worked with hundreds of couples planning their special day – in fact over the eight years that we’ve been in business we have made and delivered on average two ice displays or sculptures every single week! 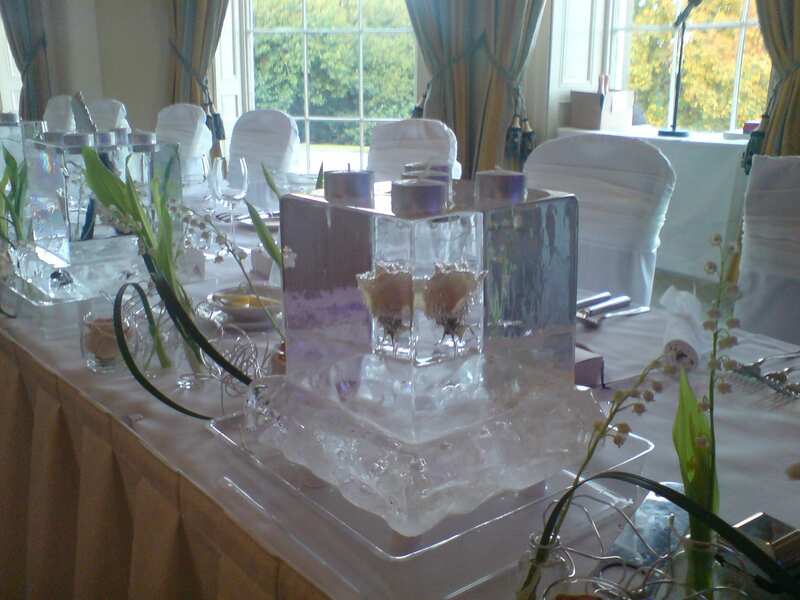 We have also worked with dozens of beautiful venues to create wedding decorations, and several list us as their recommended supplier of ice sculptures, which makes delivery and set-up incredibly simple, although even new venues are not a problem. 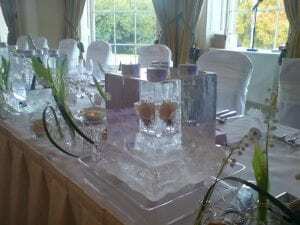 Ice sculptures can give many different effects to a wedding – they can be understated and classy, bold and fun or even functional, but no matter what purpose they serve they are guaranteed to be striking and beautiful. Swans are a classic symbol of monogamy and are as popular in wedding ice sculptures as hearts and doves. However there’s no reason you can’t go for something more personal and unique as no design is beyond our skill level and the design possibilities are endless. We work closely with you to design unique and bespoke sculptures, through which you can tell the story of your relationship. Maybe you fell in love over a mutual enjoyment of horror and sci-fi – you could have a sculpture of Freddy’s clawed hand, or a frozen Dalek to watch over the proceedings. In the past we have created a 1960s Batmobile for a couple who loved all things Batman. We can transform sculptures into vodka luges, with a little work. 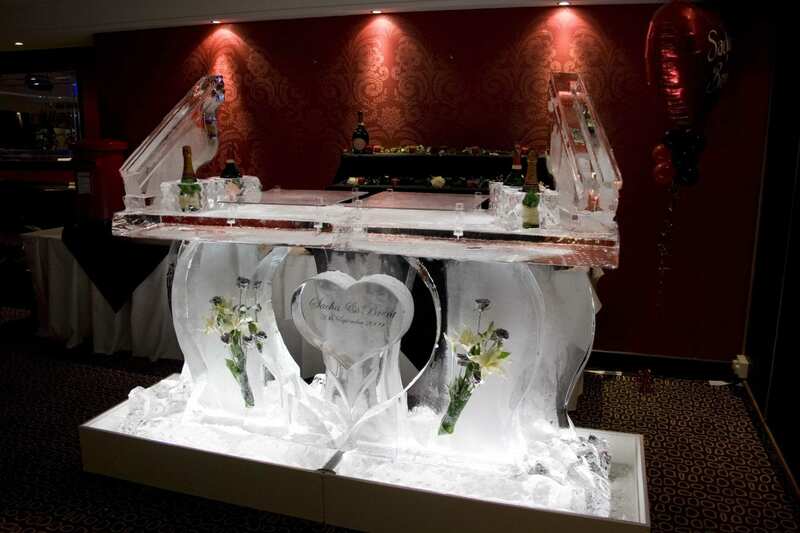 Ice luges are hugely popular at wedding receptions and are a fun way to serve drinks to your guests, but most importantly can be made to virtually any design you can imagine. We have created a skull luge for a gothic wedding, a fire engine luge for the fireman groom in another, and even a camel luge for a couple from Dubai who wanted a bit of ‘home’ with them. 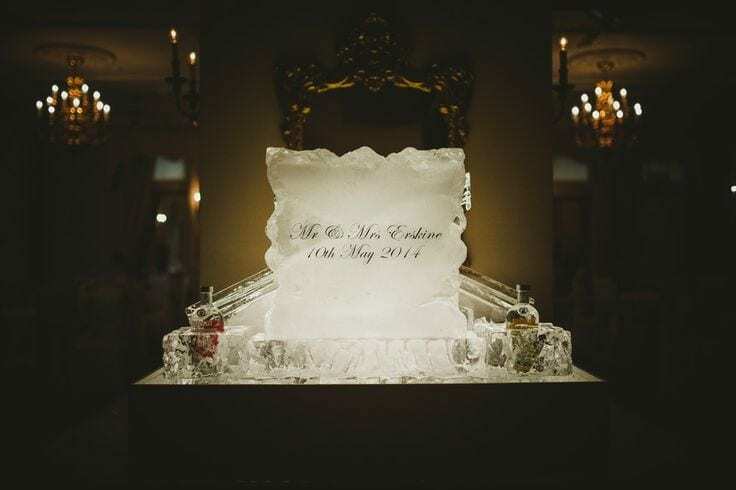 If you want to think a little bigger we have many years of experience in making full ice bars – one of our regular wedding venues is the beautiful Peckforton Castle, which is perfectly sized for a fully-working ice bar. Incorporating colour into ice sculptures is a simple way to match it beautifully with your wedding theme. This can be achieved in two ways; either by using LED lighting or by incorporating physical objects such as jewellery, flowers or name plaques into the sculpture itself. They can also be used as centrepieces on the tables, dramatic pedestals for the wedding cake, or simply sit behind the happy couple to make for some striking pictures. One of the most exciting projects we were commissioned to make was a life-size replica of a ‘Waltzer Booth’ the bride’s father had once built for his Fun Fair. It was personal to the couple and their family, and was used practically for the serving of cocktails and vodka shots. But most importantly it looked incredible. The bride even said it was the best part of the wedding – no small feat on such a big occasion! Based on a Fun Fair ride, we simulated the joy of the carnival in this intricate Ice Bar. Ice sculptures can have other practical purposes at weddings too. 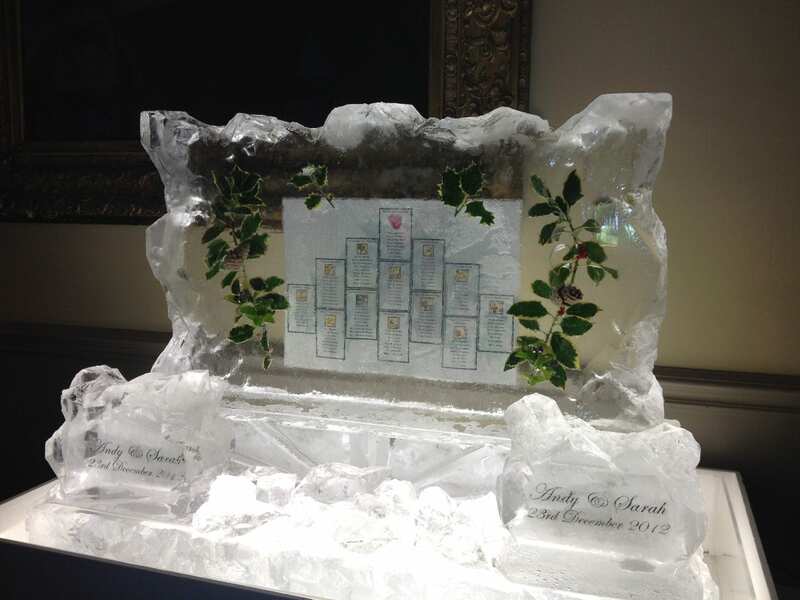 Floating a wedding seating plan in ice is a great way to liven up a piece of information, while some of our clients have commissioned ornate frames made of ice which make for great photograph opportunities. Untouched ice displays like this can last over twelve hours and still look as good as new, as all of our sculptures are set up on light boxes that catch any melting water – so there’s no need to worry about cold puddles on the floor! No venue is too far for us – we’ve transported ice bars and table plans to the Republic of Ireland and ice sculptures for weddings in Aberdeen, on top of the already prolific amount of other ice sculpting work that we carry out throughout the world. Give us an hour and a half to set up your piece and a little time to de-construct it at the end of the night, then forget about our part of your big day and just enjoy the ice experience. 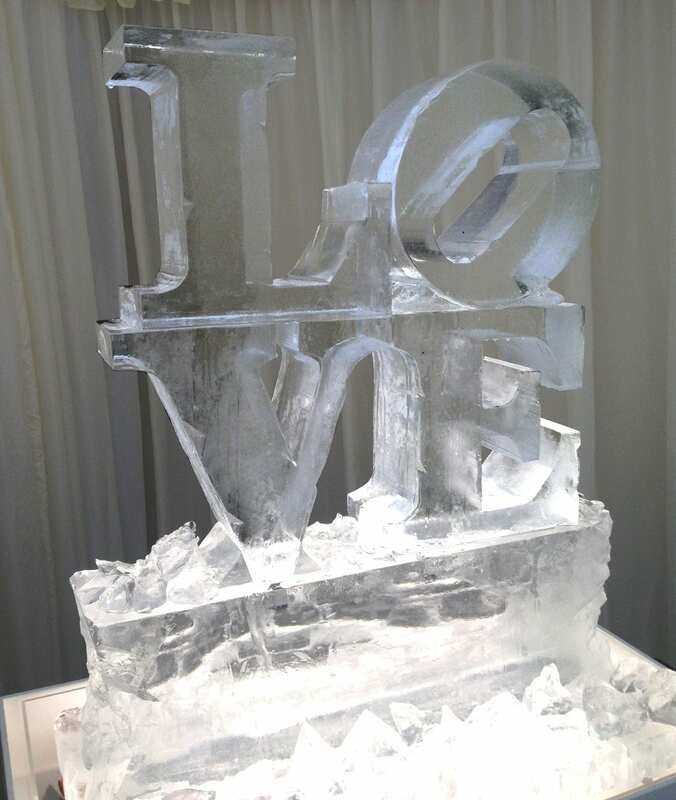 Here at Glacial Art Ice Sculptors we love a challenge, so you can feel free to come up with some truly unique, beautiful and personal ideas for your wedding – no need to choose from our existing portfolio. 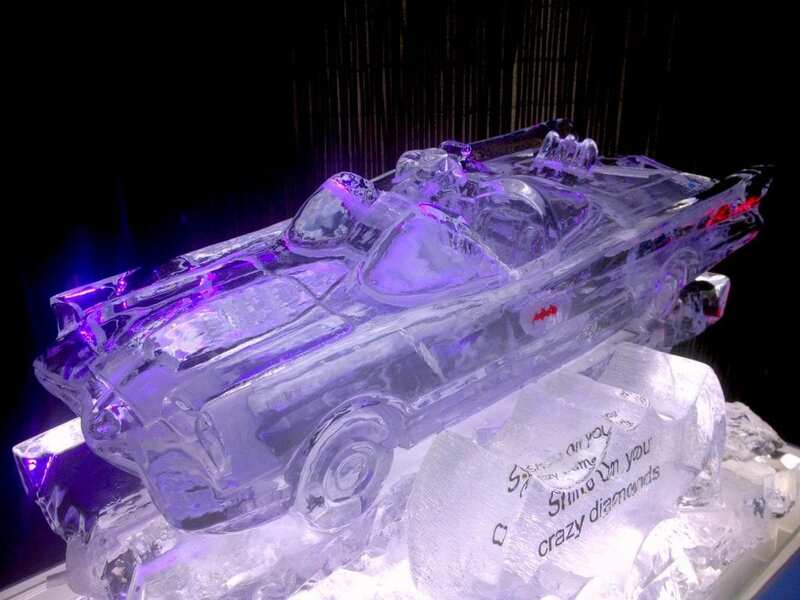 If you think you might like an ice sculpture, luge or bar at your wedding but aren’t sure of what design, we can talk you through what would mean the most to you and your family, and help it to fit perfectly in your venue.